I sit on a log. Rodney stands next to me practicing couch. Milton works. Sky and clouds arrange to be scenic. Update: I’m told this post wandered from artistic out into vague. Here’s what was happening. My top hand is brilliant at lungeing, long lining, etc. While Milton is doing his circles, I am holding Rodney. Since we do not have a separate arena, one horse gets held while the other works. One assumes this is temporary. Over time, they will adjust to the paradigm. Plus, it is not a bad thing for Rodney to hang about doing low-key activities, such as playing couch. He’s really enjoys watching another horse work. I’m sitting on a railroad tie that borders the dressage space. I look up to see a gorgeous blue sky. We do not usually get such striking sky colors in the Southeast. I take a picture. 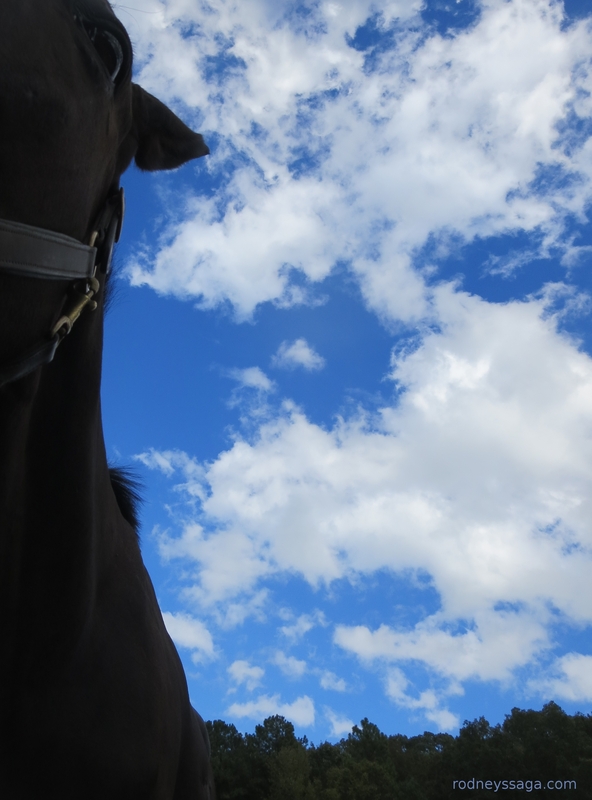 I frame the sky with Rodney’s head for depth. When I proofed the post, I realized that my position could be misconstrued as a fall. I wanted to correct that. The theory behind Foto Friday is to emphasize the photo, so I kept the text to a minimum. I was hoping to clarify rather than confuse. I appear to have failed. The main, indeed only, point of the post is Look! Look! Pretty sky! Update the second: My Foto Friday pictures are about technique and style. Regular post pictures are about content, e.g. new hat, pile of shavings. I’m all about content. I need to work on art.